When viewing Customer/Sales/Orders, the default display is to list orders created in the last 90 days. Some of our large projects take longer than 90 days to ship and we would prefer to see a larger range of history without having to change the calendar every time. is that a custom screen? There is no top menu customers, there are Sales/Sales Orders/List Open. From Sales/Customers/Workbench, that has orders on it? You could make that a date and ASC or DESC to get them to load like you want ( if that is the screen). 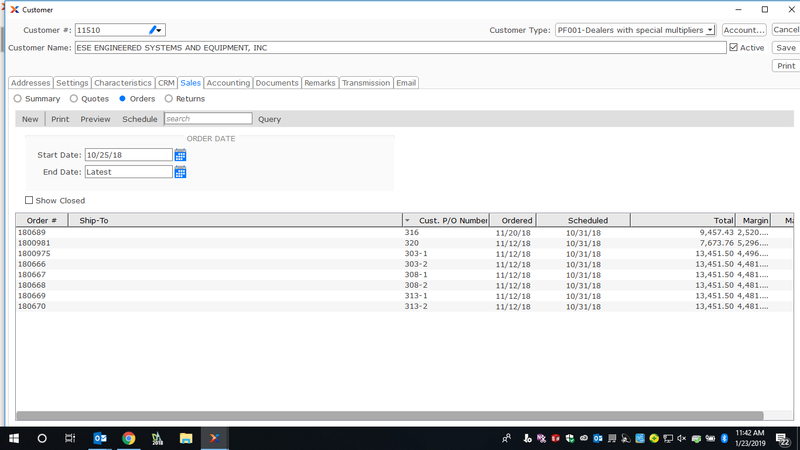 If I remember correctly, and you are on a fairly recent xTuple release, there is a configuration option in Sales->Setup under the Customer Defaults tab called "List SOs start Date". This defaults to 90 days, change it and see if that helps you.